I have been making little cuddle ponies for friends on here for a bit. These are older ponies in good shape. They are custom made to inspire, comfort, and be a tiny reminder even a plastic pony can be a friend if you need one. These ponies are Random in color some are G1 Or G3 I don't do the smaller ones. I cant promise a color and I don't rehair. 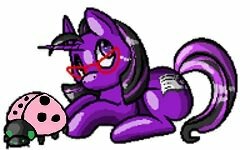 What I do is put words or quotes on the pony for what you need the pony for and I will custom fix the hair or I can leave it. The pony will get a cutie mark of some sort. I do offer ponies with no hair with custom scarfs for people going through chemo or other types of process where hair loss is a issue. I can also make the pony have a cast or small personal trait if wanted. These have no name and are not fancy they are mean to offer a little ray of comfort if you need one. I can only make these with in the US as shipping cost are too high over sea. IF you have a pony you want to send I will gladly paint it but the shipping to me is on you I will ship back to you for free. If you have any extra old ponies you want to offer so others can have them I be happy to take them in. They go for the cuddle pony project only and will not go for other thing such as custom to sale on the board or for sale by themselves.